THERE WAS A crash at Fifth and Maine last night. It hit a little too close to home, er, the business. 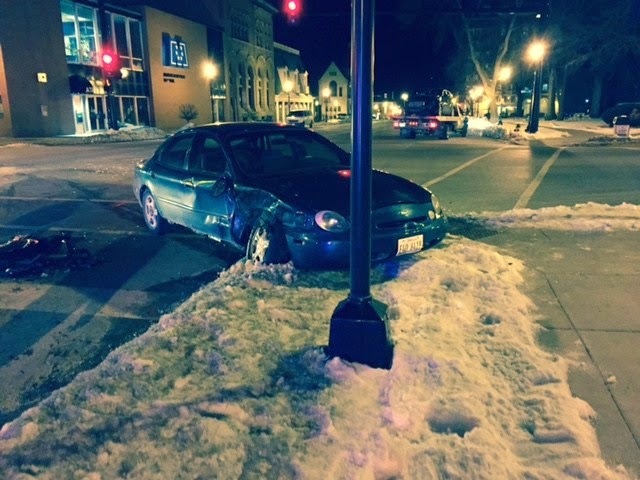 WGEM photo of the crash last night by our front door. Click here for the WGEM link. It doesn't sound like the physical injuries are really serious, but I feel for the poor people who were simply minding their own business while another vehicle ran a red light. Judging from the footage, there was a ton of debris in the intersection, and there's still a lot of glass and car parts on the sidewalk and street. One of the vehicles came to rest about 15 feet from the front of Second String Music. Without speculating why the red light was ignored, it's safe to say one moment of carelessness or not paying attention can cause a lifetime of harm regret and harm. I'm just glad nobody lost their lives. One of the vehicles could have very easily hit our building, too. We've come too far and are doing too many good things to have something like that happen. Be careful out there, Q-Town!